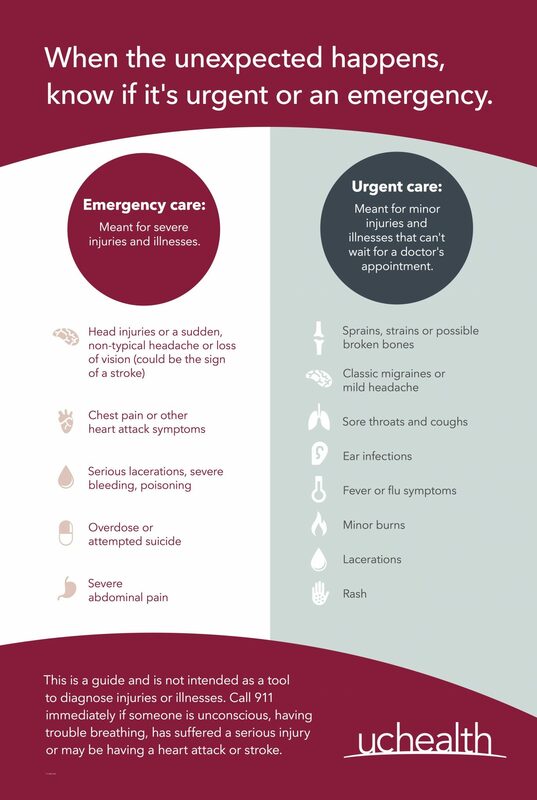 When it comes to deciding whether visiting a UCHealth emergency room or urgent care facility, it’s important to make the right choice—for your own health, and to keep our emergency rooms open for true emergencies. Approximately 30 percent of patients who come to the emergency room should have gone to an urgent care facility instead. Use the guidelines below to help you decide which facility is the best place to treat you. Always call 911 immediately if someone is unconscious, having trouble breathing, has a serious injury or may be having a heart attack. If the illness or injury seems more critical than something you’d see your family doctor for, or if you need care in the middle of the night, go to the nearest emergency room. If the illness or injury is something you’d normally see your family doctor for but you can’t get an appointment right away or it’s after hours, urgent care is the right choice. *Remember to bring your insurance card and a photo ID. This is a guide and is not intended as a tool to diagnose injuries or illnesses. When in doubt, call 911.